* Versions disponibles: 16329 - Usagé, tous les jeux à disque et tous les jeux de consoles portables viennent avec leur pochette. Worms: Open Warfare 2 is an artillery and strategy video game and the ninth installment in the Worms series. It was developed by Team17 and Two Tribes, and published by THQ for the PlayStation Portable and Nintendo DS in 2007. 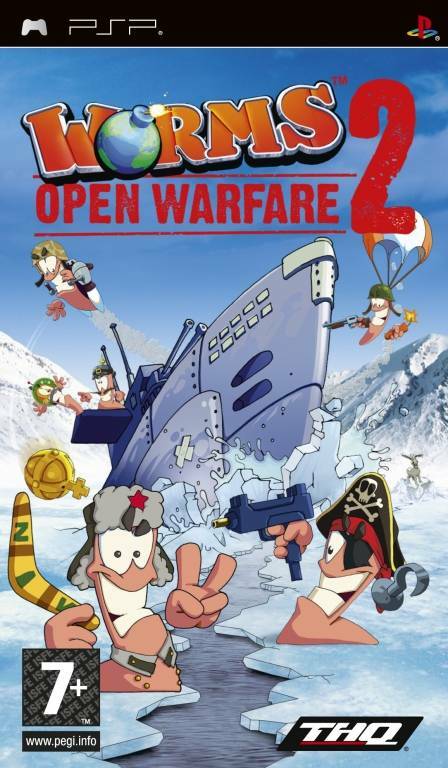 It is the sequel to Worms: Open Warfare. The gameplay of Open Warfare 2 is similar to that of previous games in the series. The game is viewed from a side-scrolling perspective. The player takes control of a team of several worms, and is pitted against other teams of worms under the control of AI (if in Singleplayer) or another Human (if in Multiplayer). Actions are performed in time-limited turns that cycle through each team. The winning team is that which can kill the opposing teams' worms; this can be achieved by using various types of weaponry and tools, availability of which depends on the game mode being played. Battles takes place on randomized, destructible terrain, which are visually distinguished by themes; "Forts" mode takes place on two forts, whose terrain depends on the theme. The player is able to select victory dances and color schemes for their worms, and to make custom race courses or fort maps using the level editor. The PSP version allows players to select hats for their worms, while the DS version includes some exclusive minigames via the "Laboratory" mode. A demo of the game has been released by download for the PlayStation Portable, and for the Nintendo DS via DS Download Station Vol. 7.